Dilwale: Shahrukh Khan's Worst Mistake? Dilwale: Shahrukh Khan’s Worst Mistake? Shahrukh Khan and Kajol came together in a clichéd crime caper, Rohit Shetty’s new film ‘Dilwale.’ The movie had nothing in common with the films the duo have done together except for the borrowed title and the unmatched marketing. 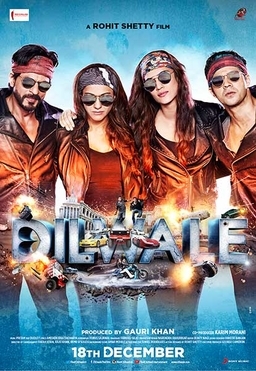 Directed by ‘Rohit Shetty & Team’ , that is exactly what the credit titles is, Dilwale uses the first word from the title of Shahrukh Khan and Kajol’s renowned movie and turns the couple’s aura in one big travesty with humor touching rock-bottom and the romance just a little above it. We learn that the beardless (a.k.a ‘young’) Raj turned thug after he, stepped in to help a damsel in distress through the flashbacks. After the painstakingly boysy beginning, including Veer (Varun Dhawan) rolling around in expensive cars and crossing a fearsome drug dealer, it’s something of a liberation when Kajol shows up as Raj’s beloved Meera. For at least its first half, Dilwale provides purposefcomul enough holiday amusement. The Khan-less scenes, jam-packed with grown men bawling like kids, exaggerate the off the wall sound effects, and the less said about Varun Dhawan’s unrehearsed love, actually reverence the better. And Kriti Sanon wasn’t even given a meaty role. There is plenty of humor offered by Johnny Lever as Money Bhai as well as Pankaj Mishra as Oscar Bhai nonetheless Boman Irani fails in both the humor and villainy departments. Despite the fact that the Shahrukh –Kajol jodi does its magic the remaining film comes to nothing due to a weak script, a lot of pointless action sequences in addition to a terrible lack of editing.